Calendar time is a hot topic! Is there even a place for it in the early childhood classroom, or should we completely throw it out? I am someone who believes that there are amazing ways to make calendar time activities successful and meaningful. 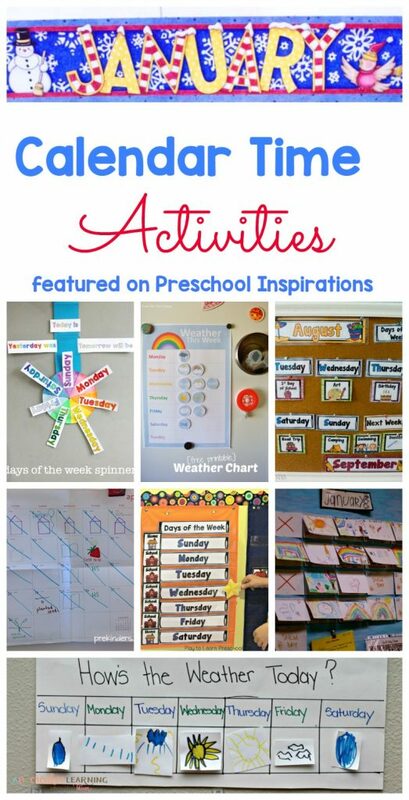 Here are some of my absolute favorite ways to use a calendar with young children that are modified and developmentally appropriate. Making Calendar Time Meaningful was my first post on calendar time. I talk about how I felt like a failure with calendar time until I realized that I was just making it too hard. I turned calendar time into an interactive center for my preschoolers, and it became an instant success. 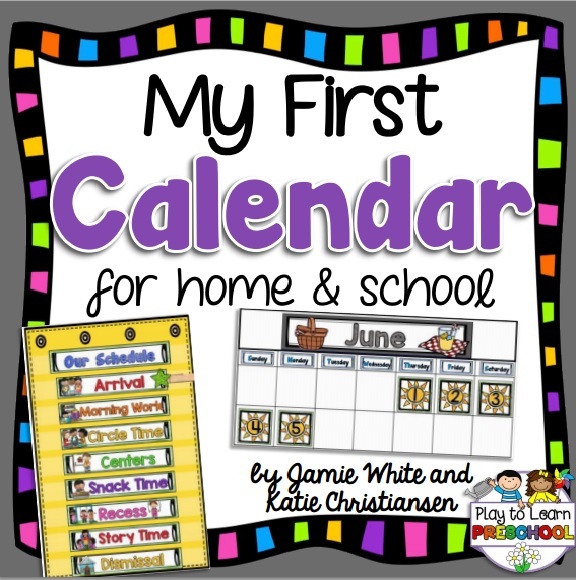 The Perfect First Calendar for Home or School is what I use with my own children. My friend Jamie and I designed this calendar for children ages 2-7. This calendar is completely centered around a child’s day, week, or month to make it engaging and to give them ownership. Pictured far right on top row. 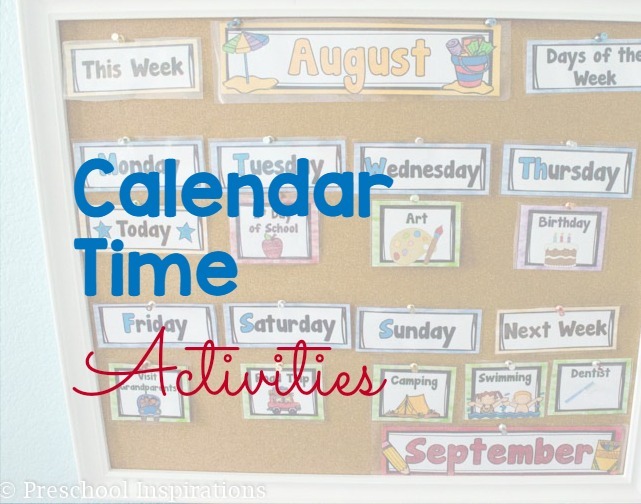 Calendar Time by Play to Learn Preschool is a dream calendar and visual schedule for a classroom. Keep track of who is at school or not and see what is next in the day. Children thrive on predictable routines, and visual pictures or cues are a perfect way to help a class or child transition to the next activity. Pictured in the middle of the second row. “Reggio Inspired” Child Made Calendar by Fairydust Teaching is one of the most beautiful calendar ideas I’ve ever laid eyes on. Each day represented is a picture card made by a student. If you are looking for something that is not commercially made, this is a winner. Pictured far right on middle row. Create Your Own Weather Chart is another child-made calendar project. I love the ease of this and how it involves children in making pictures of the weather. Pictured on the bottom row. Free Days of the Week Printable Spinner by Nurture Store is completely brilliant. The days of the week go around in a circle, which I love because it helps children visually see that a week is cyclical. Plus they can help decorate it! Pictured on the left of the top row. Making Calendar Time Meaningful in Pre-K by Prekinders is a great way to teach calendar concepts with a real calendar. Karen and I are very like-minded on this topic, and you can also read about great calendar resources in her post as well. Pictured on the left of the middle row. Simple Montessori-Inspired Magnetic or Velcro Calendar Activity by Living Montessori Now is a wonderful place for a hands-on interactive calendar! I love the idea of making it magnetic or velcro. This is also a great resource for finding more monthly Montessori work activities. 12 Months in a Year by the Learning Ark is an incredible visual representation of what months really are! This activity is inspired by the fact that a year is how long it takes the earth to go around the sun. Free Printable Weather Chart by Paint on the Ceiling is another fun and interactive way to track the weather and days of the week. Pictured in the middle of the top row. Free Printable Learning Calendar for Kids by Buggy and Buddy is an open-ended calendar that a child can use to help understand the months of the year. It can be used as writing practice, keeping track of special events, or even for a child to make a picture of the day. If you are in need of a calendar resource, this is what I use! 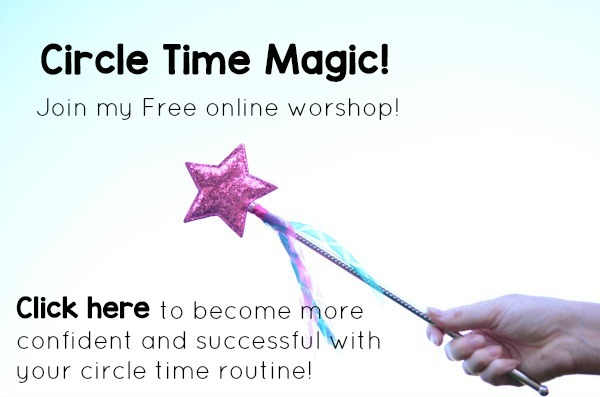 I also have a FREE workshop to make your circle time more magical. Sign up for Circle Time Success, and get my tried and true solutions! Thank you for sharing our Weather Chart! Have a wonderful week!